Need Frigidaire LTF2140FS Front Load washing machine Reviews & Ratings? Coming in at a list price of $599, this 3.5 Cubic Feet capacity washer has seen unbelievable reviews from its users. The LTF2140FS represents a true bargain given its feature set and when compared to models costing 50% more. Most users note this Frigidaire washer’s high spin speeds which do an incredible job of removing moisture and reducing dry times. Less dry time generally means lower operational costs, which is never a bad thing. This Frigidaire washer also boasts and Energy Star rating. Cycle times are usually around an hour, which is normal when compared to most front loading washers. 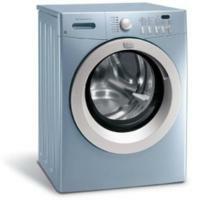 Users generally rate this washer as excellent and like the relatively low noise levels. #1) Energy Efficiency: The Frigidaire Model LTF2140FS Front Load Washer carries and Energy Star rating, which places energy consumption at 202 kWh/year. While good, there are many other Front Loading washers which come closer to the 130 range. #2) High Spin Speeds: This Frigidaire washing machine has high spin speeds which help remove more moisture and reduce drying cycles. Dryer cycles are the more costly component of the laundry cycle and by reducing it, operational savings are realized. #3) Great User Reviews: Most Frigidaire LTF2140FS reviews are positive, praising low noise, great value, capacity and quick cycle times. Expert Reviews are also extremely positive. #4) Great Cleaning: Users reviews praise this machines ability to clean well and consistently. #5) Easy to Use: User controls are intuitive and easy to ramp with. Most users where able to operate immediately after installation with minimal to no support from provided documentation. #1) Load Balancing: The Frigidaire 3.5 Cu. Ft. Model LTF2140FS Front Load Washer did experience some vibration when presented with overstuffed loads. This can be avoided by not over cramping the unit. #2) Features: This Frigidaire is a great entry level machine for medium sized families not requiring too many additional features. The feature set is relatively basic. Frigidaire 3.5 Cu. Ft. Model LTF2140FS Front Load laundry machine is a great buy at $599. At the given capacity, larger families may not find this machine adequate in keeping up with large laundry demands. Also families with King Comforters may want to consider larger washers. Overall, this is a great machine if you’re looking for an energy efficient performer without all the bells and whistles found in more expensive machines.